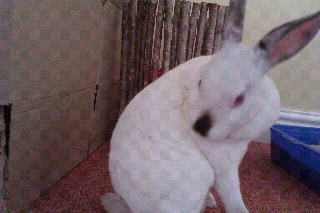 Speedy the cheeky house bunny: Painted Speedy....silly boy! Dad was painting the last fence panel ready to put it up and when it was finished dad left it to dry.Do you know what Speedy did?Speedy decided to nose around and inspect dad's work while it was still wet and got paint over his white fur.We tried to wash it out but it was to late it had dried so that meant snipping it out with scissors that was fun and games,Speedy struggle and wriggled and kept escaping but we managed to get it off.I didn't want Speedy trying to get it off him self.Silly boy! What Have you done now Speedy! What color was the paint? Might have looked dashing on ole Speedy. That is awful!!! My trick is to step in it and then run into the house and get it all over the carpet! I'm afraid we have an unfortunate case of blaming the victim here. Where were your Dad's wet paint signs. Speedy, I think Dad could be getting a little pay back for your telling on him to Mum about the red scarf? Oh, probably not, that would be pretty dastardly, but these humans just should not be allowed to play with paint unsupervised. I'm sorry, Speedy I guess it is all your fault. You should have been supervising Dad just enough out of range to avoid the red scarf. Take care little one. We really love you. Hanging out with Tom Sawyer were you?? Oh no...that could have been lots worse...somehow! I would have just let it wear off on it's own. Bet he looked cute! Never can tell about these days about what toxic stuff is in paint or anything else, despite labeling. One of our cats did the same thing years ago. Pretty funny looking, both with the paint on and after we did a little barber work on her. She hated us for weeks after that. Hmmm, only for weeks? Where did you find such an even tempered cat? Wish he had been the One Speedy met up with. Don't go be giving Racer any ideas now Speedy. We are still painting the fence where he lives, but he mostly hides out in his litle boat - still waiting a good tide and breeze. Speedy is the bravest of them all! But, Speedy, that is a lot of responsibility, because sometimes two bunnies together will get in a lot more trouble than by themselves. I'm not really worried, Speedy, I know you you to be good and noble and chivalrous. Who me?Doyou really think so?I like to keep Racer out of trouble cause its fun to do,But I do like to be cheeky...a little bit anyway...hehehe!